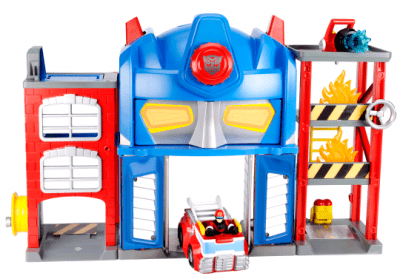 The Transformers Rescue Bots Heroes Optimus Prime playset is the ultimate hero headquarters where TRANSFORMERS and humans can work together! While the set may look like a standard firehouse equipped with fire pole, ladder, and training tower, when the call comes in, the station façade converts into OPTIMUS PRIME's robot face, complete with lights, sounds and twelve fun phrases! Little hands simply turn the dial to reveal all of the gear TRANSFORMERS need to save the day, and HEATWAVE THE FIRE-BOT vehicle rolls out to help the humans fight the fires! Whether it's an ordinary fire or a secret mission, Heatwave and Cody Burns have the 2-in-1 station they need for realistic Transformers-inspired play from Playskool. This playset folds up for quick and easy storage and transport. The Transformers Rescue Bots Heroe's Optimus Prime Fire Station set includes a HEATWAVE THE FIRE-BOT vehicle, one human fire rescue hero figure, and a storybook. The MSRP is $49.99, but it can be found at Walmart.com for $39.88 with free shipping! The toy is recommended for ages 3 and up.